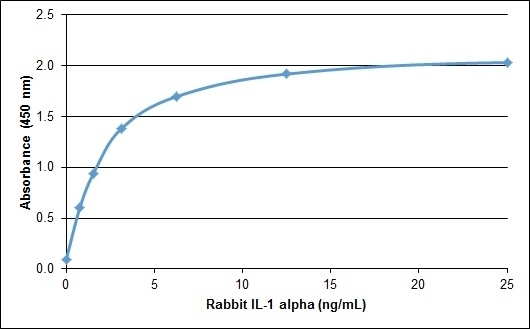 Recombinant Rabbit interleukin-1 alpha (IL-1α) is a recombinant protein corresponding to aa 113-267 of native rabbit IL-1α. Interleukin-1α is a pleiotropic pro-inflammatory cytokine and member of the IL-1 superfamily. It is secreted by activated macrophages and monocytes and is involved in the modulation of a wide range of immune and inflammatory responses. IL-1α and the closely related IL-1β, are both involved in haematopoiesis and exhibit many identical immunomodulatory properties, binding to the same type I interleukin-1 receptor, also known as CD121a. This reagent may be used as a standard in a sandwich ELISA assay in conjunction with AHP2989 as a coating antibody and AHP2989B as a detection antibody.